A partially sliced Italian loaf is spread with creamy dressing, filled with cheese, ham and tomatoes and baked for a hot, hearty pull-apart sandwich. Cut ends off bread to make 12-inch loaf. Reserve removed bread for another use. Cut loaf evenly into 12 slices, being careful not to cut all the way through to bottom of loaf. Spread dressing mixture between every other pair of bread slices. Fill with Singles, ham and tomatoes. Wrap in foil. For best results, cut bread slices about three-fourths of the way into the loaf. Prepare as directed, using one of the following flavor options: Beef & Cheese Pull-Apart: Substitute sliced roast beef for the ham. 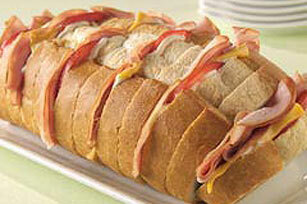 Turkey & Swiss Pull-Apart: Substitute OSCAR MAYER Deli Fresh Smoked Turkey Breast for the ham and KRAFT Swiss Singles for the American Singles.